This chitinous thing was found on a rock in the intertidal zone of the Burrard Inlet. Can you guess what it is? Correct. The third or outer maxilliped of a crab. If you look at an intact crab's mouth, you will see that it has complicated, articulated, barn-door structures covering it. These are the outer maxillipeds. 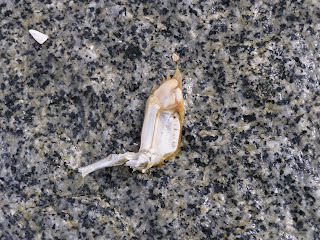 The image shows the inside surface of the left outer maxilliped, the lingual side, had crabs tongues. They don't. But they do have several more sets of appendages associated with the mouth, through which food items must pass before they can be considered ingested. From the outside in, there are the third maxillipeds, the second maxillipeds, the first maxillipeds, the maxillae, the maxillules, and the mandibles. Once through all these pairs of mouthparts, Maxwell Smart steps into the phone booth and disappears. Very informative. I did not know, or forgot, all of these crab parts. Barn door structures? Interesting metaphor--and as always, something I didn't know. Whenever I want to feel ignorant, I come over here. Thanks, Hugh. I've always liked crabs. They are sort of truncated, semi-sphericalized lobsters. The fit together like a Japanese puzzle box. Thanks, Kate. I think it has more to say about my esoteric, not particularly practical knowledge set.